I got home from my mother's memorial service yesterday and parked at the street end of my loooooooong driveway so I could finish pressure washing the driveway. I left the doors open to dry out my 8 because I spilled a bunch of water in my back floor while taking a huge flower arrangement out. I finish pressure washing and go inside to chill for a while. Come back out around 7 to close up the car and decide to move it up to the house. The engine was cold, so I decide to let it run for a few minutes before shutting it off, and take start unloading some of the stuff from the memorial. Well..... At 1:50.. AM... I decide it's time to go to bed. I look at the front door, thinking I locked it, but it wasn't. Then I thought I better go out and put the tarp over my 8 in case it rains (I have a windshield leak I need to take care of when things settle down next week), so I step outside and hear my car running... O...M...G...!!! The gas light was on and the needle was the lowest I've ever seen it. Thank God I decided to go out for the tarp!! Good news though.. it started up fine this morning and I made it to the gas station. It was kinda weird though... I expected to fill it up way more than I usually do, but it only took 13.4 gallons. Usually I put 13.6 in... Different gas station though. Would that make a difference? And FYI... it ran for all that time on a quarter of a tank. Last edited by 05TiGr8Lady; 04-11-2010 at 09:48 PM. Working on the taillights now. Both are in the bathroom and have a hair dryer propped up pointed at the drivers side taillight. Should be good to go in 10 minutes or so. I hope you got those fixed. 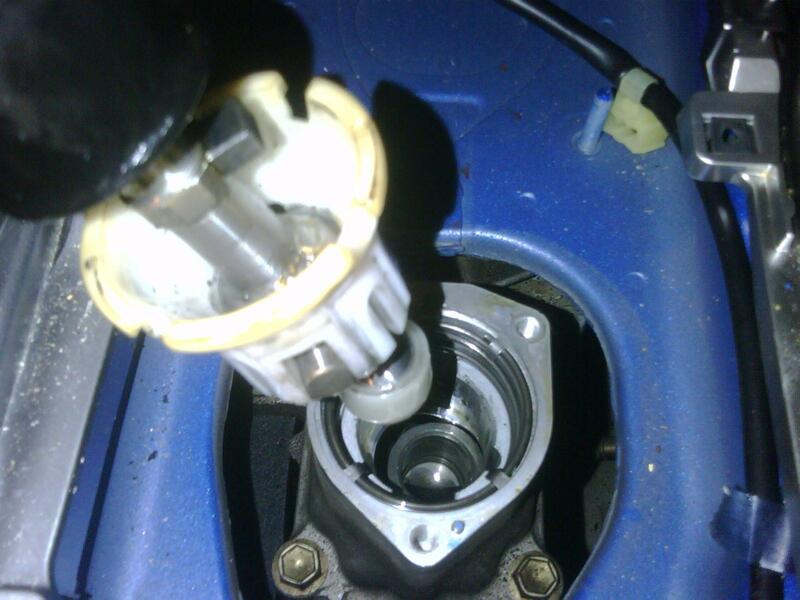 I got my shifter gasket fixed today, and it's not leaking fluid any more. Changed the transmission fluid and differential fluid. I never thought it will be so hart to find Red Line products. I went to 4 different places, and they didn't carry that product, only Baxter Auto Parts had them. 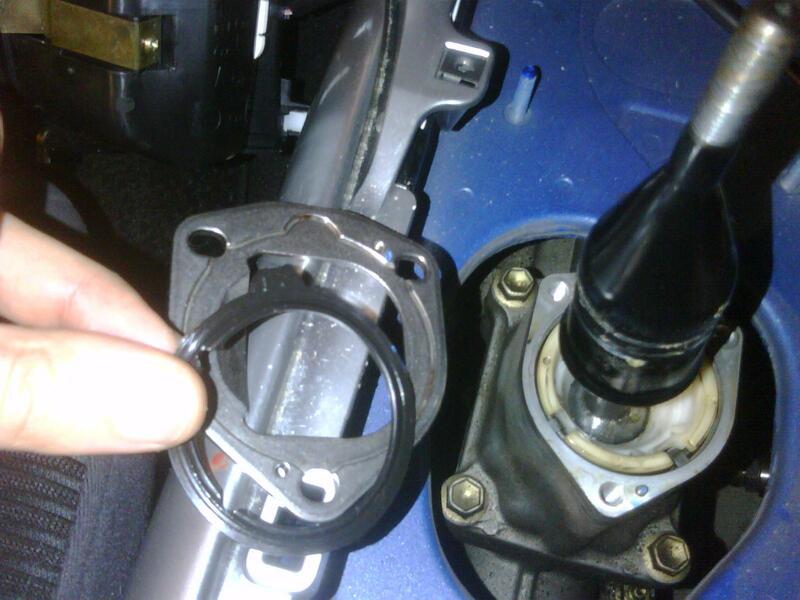 Also changed the E-Brake cover, as my plastic on the bottom broke a while back. ... I expected to fill it up way more than I usually do, but it only took 13.4 gallons. Usually I put 13.6 in... Different gas station though. Would that make a difference? If the stations pumps are out of calibration then yes. There should be stickers on the pump when Weights and Measures came out and checked the pumps. If I remember right they're supposed to check it every two to three years. I'll try to find that out. The gas light was on and the needle was the lowest I've ever seen it. Thank God I decided to go out for the tarp!! Good news though.. it started up fine this morning and I made it to the gas station. It was kinda weird though... I expected to fill it up way more than I usually do, but it only took 13.4 gallons. Usually I put 13.6 in... Different gas station though. Would that make a difference? Fun fact I learned while in Upstate NY, Indian Reservation pumps don't get checked by Weights and Measures. A tow truck driver once told me he put 70 gallons into a 55 gallong barrel at the casino's gas station in Oneida, NY. Linda, was this a strawberry blonde moment? I managed to put 15.1 gal in my tank at Costco a few days ago. It was a bit of a WTF moment, because I knew I was very low, but It hadn't run out yet. I've never seen a pump tell me I put in more than 14.6. And the one time I ran out (150' from the pump) I only got 14.3 into it. Picking up my Stoptech rotors at Corksport today. One must always keep peace with the "war department". Nick - Good to know the light comes on with 2.9 gal left. In that case, I wasn't sure when the light came on. I was sweatin' it on the way to get gas. Kevin - A strawberry blonde moment? Naw... I don't usually get those. For me, it's more of getting freaking old/lack of hormones moments. You'd have to read my previous posts to see what caused this lapse of memory. i'll test fit on my car for you. Damn pdkhak I've been eyeing those rotors for awhile on corksports site but I want to pick up there racepipe first Let us know how the install goes! Did they have everything in stock? I need to replace my pads and rotors after I return from Iraq. But it'll be a few weeks after since I go home for the 4th of July. They were not in stock. They took a week to come in though so not a long wait. I have Hawk Ceramic pads now. They should still be good so not changing them yet. I have Hawk Ceramic pads now. I've got those too. I installed them together with my rotors, and I think they are very good HQ street pads. Sad day for the RX-8. Mazda has ended production.